Help adults and caregivers teach little ones the importance of fire safety and prevention early in life -- and instill a solid fire prevention foundation. 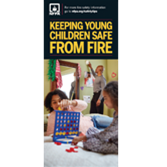 NFPA®'s Keeping Young Children Safe from Fire Brochures are packed with nearly 24 tips. Simple, easy-to-follow tips to keep kids fire safe show parents and caregivers the best ways to help prevent kids from getting scalded or burned...how to plan and practice a family fire drill...and how firefighters are helpers in their community. How to recognize the smoke alarm sound. What to do if there is a fire -- stay outside, and don't ever do this one thing. To dial 9-1-1 if there is a fire. What to do if clothing catches fire. How to plan and practice an escape plan. Help the members of your community show children how to stay safe from fire and reduce the risks of burns and injuries. Hand out Keeping Young Children Safe from Fire Brochures and save more lives! Order today to give caregivers, teachers, daycare centers, and families, practical and lifesaving information.